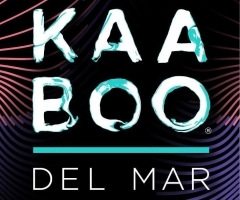 KAABOO Del Mar 2018 forged on with Day Two on Saturday, September 15th. 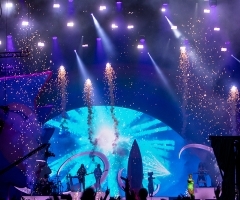 Attendees poured into the Del Mar Fairgrounds just as early as the day before to catch opening acts Lost Beach, Creature Canyon and FITNESS before Soul Asylum took the MGM Stage to much applause. 90s-lovers basked in the early day nostalgia (whether they were in the designated 'Bask' section or not) with Melissa Etheridge and Cake still to come! SWMRS kept the alt going on the Sunset Cliffs Stage while the other two stages were occupied by Better Than Ezra and Bebe Rexha, a queen amongst pop princesses. 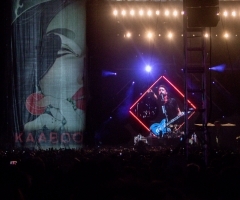 With such an outstanding soundtrack packed into two short days, how could KAABOO 4 get any better? Across the grounds, Robert DeLong took EDM to a whole new level, bouncing from sound manipulation via joystick to jamming on a double keyboard to throwing drumsticks at cymbals when he was done with them. His latest "Revolutionary" single isn't just a club jam; it's social commentary at its finest. Speaking of that new new, Big Boi brought the business in high hip hop fashion next. Hyped up, the crowd then split for Stone Temple Pilots, Etheridge or Billy Idol, the latter performing hit after hit in iconic 80's rock style. Cake followed up Melissa Etheridge on the Trestles Stage, with one of the most entertaining acts, Stealing Oceans, coinciding over at the Tourmaline Stage. Shouting lyrics alongside hundreds of people all jumping together for Stealing Oceans was a true highlight of the entire fest. The all star Saturday lineup ended with Earth Wind & Fire on one stage while Imagine Dragons on the other – another tough call. 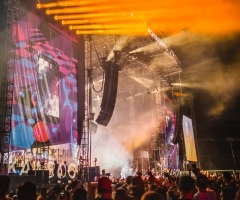 With such an outstanding soundtrack packed into two short days, how could KAABOO 4 get any better? Check back for Day Three 2018 highlights, coming soon.